Monitoring resident safety and needs as well as communicating to coworkers to keep a clean and enjoyable facility and environment are two major needs for any nursing home. Two way radio walkie talkies help you communicate effectively in order to better serve your residents and work together as a team, which improves resident satisfaction and makes you more money. Using earpieces adds a level of privacy and professionalism while improving the clarity of your messages. Whether you are cleaning the facility, helping residents in need, hosting an activity, giving a tour of the property, or preparing meals two way radios will take your efficiency and communication to a new level. For smaller nursing homes and care facilities, the Motorola CLS1110 and Motorola CLS1410 offer compact and simple communication covering up to 200,000 square feet in most cases. These walkie talkies have a display screen and a large push-to-talk button on the front so communication is super easy. The CLP1010 is similar except that is includes an earpiece and must be used with an earpiece. Slightly larger nursing homes can use the Motorola RMU2040 two way radios, which will cover up to 250,000 in most environments. Most nursing homes will need a more powerful two way radio, such as the Motorola RDU4100. The RDU4100 is 4-watts with 10-channels, has great audio quality, and fantastic durability. 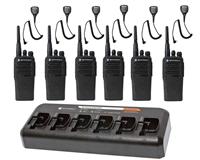 You can get 6 that are ready to go with the Motorola RDU4100 High Power Radio Package.